Board games have had a resurgence in popularity in the last ten years despite the fact that almost every other medium of entertainment is rushing to go digital. Of course, plenty of board games are making the jump to the iPad, but actual physical games continue to sell. There are many possible reasons for this, some of which I hope to explore in the future, but one that immediately jumps to mind from my own experience is the ease with which one can create variants. What do I mean by this? Well, even the best game will not appeal to everyone. Some people love the social interaction of a family game like Monopoly, while others find hours spent rolling dice and hoping you avoid that hotel on Boardwalk a ridiculous waste of time. Poker and Bridge allow players to test their ability to read their opponents, while Chess or Checkers are games with perfectly open information where the winner is determined purely by which player makes the best moves. The differences in opinion don’t always have to be so extreme, however. Even among a group of Chess enthusiasts there might be some that desire a slightly different experience, even if only as a change of pace. With physical board games, players can change the rules in any way they see fit and repurpose the material pieces in any way their imaginations take them. This is quite unlike playing a video game where changing how the game works is only possible for those with the necessary skills. So, just to illustrate how drastically a classic game like Chess can be changed with just a few edits to the rules, I’d like to describe three interesting variants one can play with basically your traditional chess set. 1) Progressive Chess – there are many versions of this style of chess, but the common thread is that the players make an increasing number of moves each turn. Rules are pretty much identical to traditional chess, but after white takes his first move black gets two moves, then white takes three moves, and black takes four moves, and so on. This one change to the Chess ruleset forces players to think in combinations rather than single moves. As the game goes on the variations get more and more complicated and interesting. 2) Anti-King Chess – There are a few minor tweaks to movement rules, but the basic addition here is an additional piece, the Anti-King, who acts much like the regular king except that it is in check any time it ends its turn while not in check. 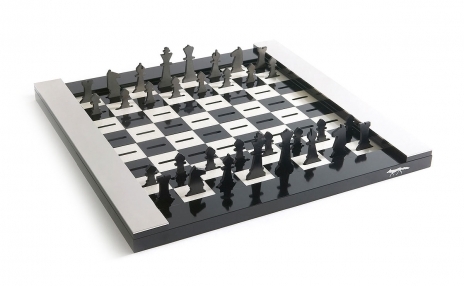 To play Anti-King Chess requires only an additional piece from a non-matching set of chess pieces. In this variant players now have to defend themselves on a second front, plus they have to go against their basic Chess instincts and find ways to put the Anti-King in constant danger. 3) Losing Chess – Event more antithetical to traditional chess strategy is Losing Chess. Just as its name implies, the goal is not to put the other king in check but to lose as many of your pieces as possible. In this variant the king has no special rules and acts like any normal piece that can be captured. In addition if it is possible to capture an opponent’s piece you are obligated to do so. Only a couple rule changes yet the entire game is transformed into a new puzzle to solve. The beautiful of these and other variants is that the brain is forced to rethink its habits and re-learn a favorite game. There’s no need to buy a brand new game when with just a little creativity you can transform your current favorite into something uncanny and filled with new surprises.